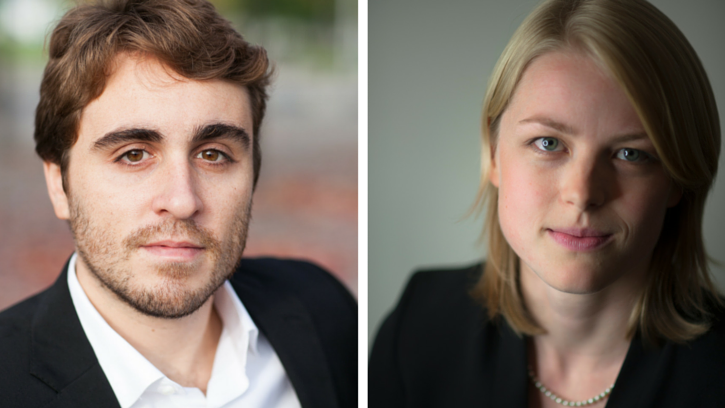 This season the Seattle Symphony welcomed two new members on the conducting staff, Pablo Rus Broseta as the Douglas F. King Assistant Conductor and Ruth Reinhardt as Conducting Fellow. Their roles are part of a larger training and mentoring program at the Seattle Symphony that helps to shape future Music Directors. Among their many job duties are personal preparation of all scores and attendance at all rehearsals and performances as the “understudy” to the conductor, occasionally pre-rehearsing for other conductors’ concerts, leading concerts (especially neighborhood, family and education concerts), editing concert recordings for radio broadcast and grant support, and working with the artistic staff on programming ideas. While Rus Broseta has the lion’s share of these responsibilities this season including numerous public performances, as Conducting Fellow, Reinhardt serves as conducting cover for six weeks this year and she led the Roosevelt High School Side-by-Side Concert and Peter and the Wolf. Rus Broseta has been promoted to Associate Conductor next season. Past Assistant and Associate Conductors for the Seattle Symphony have gone on to Music Director roles all over the country. A few examples: Adam Stern (Assistant 1992–96; Associate 1996–2001) is now Music Director of the Seattle Philharmonic and the Port Angeles Symphony; Alastair Willis (Assistant 2000–02; Associate 2002–03) is now Music Director of the Illinois Symphony Orchestra; Carolyn Kuan (Assistant 2006–07; Associate 2007–09) is now Music Director of the Hartford Symphony; and Stilian Kirov (Assistant 2012-13; Associate 2013–15) is now the Music Director of the Bakersfield Symphony Orchestra and Symphony in C.